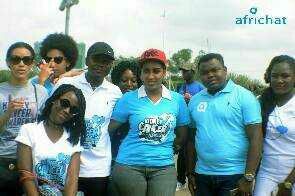 Juliet Ibrahim embarks on 'A Kidney Health Walk For All' - BlogIT with OLIVIA!!! On Thursday, March 10th, 2016, The Juliet Ibrahim Foundation commemorated its annual Awareness Campaign on Kidney Cancer on World Kidney Day.The goals of the Health Walk are to spread awareness of the signs, symptoms, and risk factors of Kidney Cancer, to educate communities about the importance of early detection and how it could be prevented. The annual walk which began at 11 am started from the Accra Mall, at the Tetteh Quarshie Roundabout and ended at the A&C Mall inside East Legon — featured an assembly of friends and loved ones, volunteers, dancers, models and stuff from Twillium Industrial Company Limited. Supported by Dr. Malt, participants enjoyed a float, which included free drinks, Verna Mineral Water and music from a DJ. Dozens of people donned creamy, white and blue shirts, with the White and Blue featuring the words, "Kidney Cancer Awareness." 20 Gorgeous Braided Hair Ideas for 2018 with Beautiful Pictures. Home | . | Contact Us Copyrights OLIVIANGENE © 2018, .